Friday, April 1, 6 pm – 10 pm. Maui Academy of Performing Arts presents Delights of Broadway. Broadway entertainment, musical themed dining tables. Includes dinner buffet and 2 drink tickets. Come dressed as your favorite Broadway character. King Kamehameha Golf Club, Wailuku. $150/person. Saturday, April 2, 8 am – 5 pm. Maui County Ag Festival. One of the biggest festivals of the year, with cooking demonstrations, food tastings, giveaways, special breakfast, poi pounding, and entertainment. $5, free for children 12 and younger. Maui Tropical Plantation, Wailuku. Saturday, April 2, 7 pm. The Merwin Conservancy Presents Jane Hirschfield in the Green Room. April is National Poetry Month and Jane Hirschfield is a celebrated poet, translator, and essayist. Poetry reading and reception with live music, pupus (appetizers), and book signing. MACC, Wailuku. $25/person. Sunday, April 3, 9 am – 1 pm. TEDx Youth Maui. Student speakers from public and private schools will share their ideas, talents, and inspiration. Student tickets $18, adult tickets $30. Seabury Hall, Makawao. Friday, April 8. 6 pm. Artof Trash Opening Night with a Trash Fashion show and entertainment. Come dressed in trash. Art of Trash Exhibit runs daily through April 30. Maui Mall, Kahului. FREE! Sunday, April 10, 11 am – 3 pm. Italian American Club of Maui Chocolate Fundraiser. Includes wine tasting, beverage, and chocolate. Bring a chocolate dessert and $10 for the fundraiser. Ulupalakua Ranch, Kula. Wednesday, April 13, 10 am – noon. Art with Aloha: Kapa Making Demonstration. Visiting Artist Dalani Tanahy will demonstrate the art of kapa (aka tapa), Hawaiian barkcloth. Hui Noeau Visual Arts Center, Makawao. Free! Friday, April 15 – Saturday April 16. Times vary each day. Lahaina’s Chinese Kite Festival. Fun for all ages: kite making, kite flying, kite fighting and kite acrobatics. Music and refreshments available. Wo Hing Museum, Lahaina. Free! Friday, April 15 – Saturday April 16. 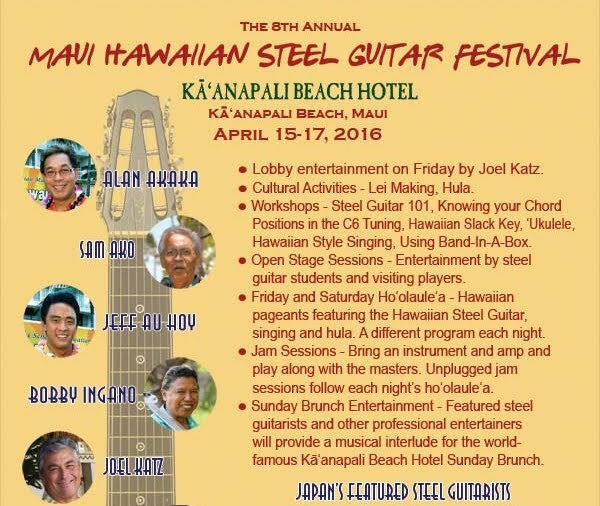 Hawaiian Steel Guitar Festival. Workshops for different levels, open jam sessions, entertainment by professionals and students. Kaanapali Beach Hotel. FREE! Saturday, April 16, 8 am – 3 pm. Butterfly Effect – 10th Year Anniversary. 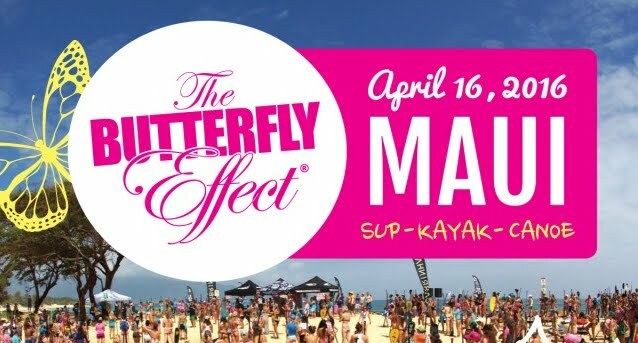 The Butterfly Effect is a movement to empower women through water sports, in a non-competitive way and to come together as a community. Participate in this 3 km water event or enjoy watching the “butterflies.” Paia Beach. Sunday, April 17, 10 am - 6 pm. 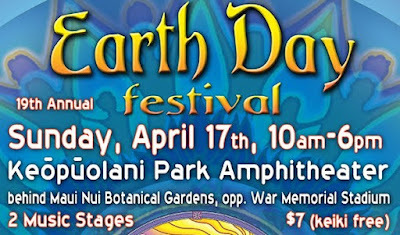 Maui Earth Day Festival. 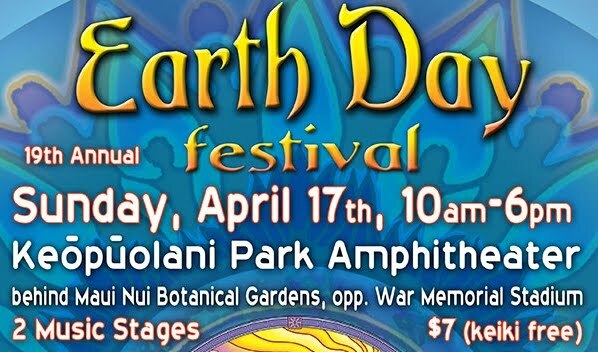 Two music stages, activities for the keiki, food, crafts, information booths. Keopuolani Park, Kahului, $7 adults, free for children. April 16 - April 24. National Park Week. Free admission to Haleakala National Park and other national parks until midnight on Sunday, April 24. Other events include Talk Story with Uncle Rex on April 23 and daily free cultural events at the Kipahulu side of Haleakala National Park. April 16 - April 24. Brian Walks Maui. Brian Santos, is walking the perimeter of Maui to raise funds for Haku Baldwin Center. Friday, April 22, 7 am. Earth Day Beach Clean Up. Westin Maui, Kaanapali Beach. Friday, April 22, 8:30 am. Blue Aina Earth Day Clean Up. Meet at Lahaina Harbor. Reserve in advance for snorkel trip to clean up the reef. $30/person. Saturday, April 23, 9 am – 3 pm. Haiku Hoolaulea aka Haiku Flower Festival. A festival for all ages, celebrating spring. Entertainment, bake sale, lots of activities. Haiku Elementary School, Haiku. FREE! Saturday, April 23, 5 – 9 pm. An Evening in the Gardens – Maui Nui Botanical Gardens. 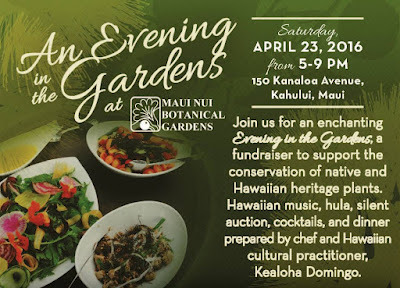 Fundraiser soiree celebrating the rich heritage of Hawaii’s native plants. Dinner, drinks, music, hula, and silent auction. Maui Nui Botanical Gardens, Kahului. $100. Friday, April 29 – Sunday, May 1. St. Joseph’s Feast. 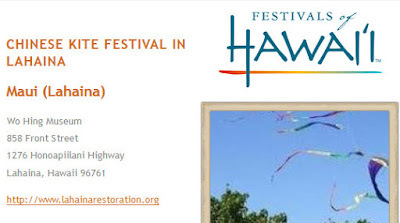 An Upcountry Maui tradition with crafts, food, music, and entertainment. St. Joseph’s Church, Makawao. Free! Friday, April 29, 6:30 pm – 9 pm. Maui Matsuri Kick-Off Eventfeatures Japanese dancing, taiko drumming, Hello Kitty coloring contest, and karate demonstrations. Queen Kaahumanu Center, Kahului. Friday, April 29, 6 pm. Baldwin High School Hoike. A year end event of storytelling and hula featuring the island of Oahu. Free and open to the public. Friday, April 29 – Sunday, May 1 (7 pm, 7 pm, 3 pm). Common Ground Dance Festival. Seabury Hall. A dance showcase highlighting youth dancers from across Maui as well as Seabury Hall dance students. Seabury Hall, Makawao. $5-12. Friday, April 29, 4 pm. Hana Poi Supper: A Benefit for the Hana Youth Center. Join Travaasa Hana, Edible Hawaiian Islands, and Hana Ranch Provisions for a farm tour, demonstration of poi pounding, and a 5 course meal. Hana. $95. Saturday, April 30, 9 am – 5 pm. East Maui Taro Festival. Farmers Market, arts and crafts, poi pounding demo, variety of taro for sale, food booths and education. Hana Ballpark, Hana. Free! Saturday, April 30. 5 pm. Carden Jamboree. BBQ dinner, live dancing, music under the stars for Carden Academy. Makawao. $100. Saturday, April 30, 9 am - 7 pm. Maui Yoga Festival. All day event with yoga classes, chanting, other workshops, craft booths, food, and more. Makawao Union Church. Prices vary. Sunday, May 1, 5 pm – 9 pm. May Day Festival at the Maui Historical Society, Wailuku. Lei contest info here. Labyrinth walks, on or near the full moon each month and on Thursday afternoons at the Sacred Gardenof Maui, Makawao. 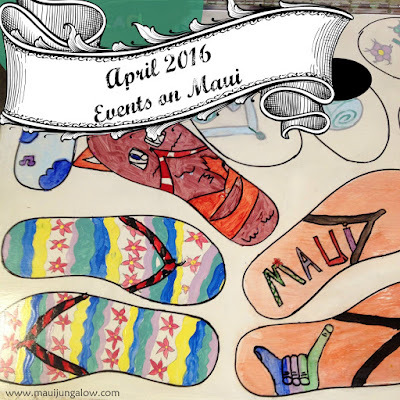 There are many other events on Maui at Calendar Maui, Maui Time, Meet Up and Go Hawaii, Edible HI.